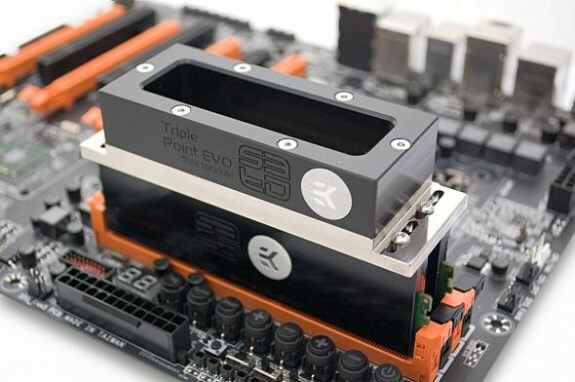 EK Waterblocks reveals the EK-SD3D Triple Point EVO, the company's first LN2 evaporation cooler. Designed to chill and overclock memory modules to the extreme, this new product supports virtually any SDRAM memory module of any generation. It will ship later this week for 74.95EUR. EK Water Blocks, Ljubljana based premium water cooling gear manufacturer, is proud to introduce EK-SF3D Triple Point EVO, company's first product from the line of liquid nitrogen (LN2) evaporation cooler for competitive overclockers. Used in conjunction with up to four Module Adapters this unit allows extreme overclocking of virtually any (DDR-)SDRAM memory module (of any generation). EK-SD3D Triple Point EVO is a product of joint venture between Petri 'SF3D' Korhonen, legendary overclocker and extreme evaporation cooler designer from Finland, and EK design & engineering team. The product is made of electrolytic grade nickel plated copper in order to provide the necassery mass to even out the temperature fluctuation. Top extension is made from high quality POM Acetal - with it's poor thermal conductivity it is better at preventing unwanted condensation formation that many overclockers are not fond of. Bundled with the evaporation cooler itself are the two (2) EK-SF3D Triple Point Module Adapter heatsinks. Each of these items are made of CNC machined high quality aluminium and feature black anodized finish. Heat transfer between the memory module and aluminium heatsink adapter and copper base of the EK-SF3D Triple Point EVO is ensured by the use of enclosed Gelid GC-Extreme TIM (grease). The product is readily available for purchase through EK Webshop & Partner Reseller Network and comes with Manufacturer Suggested Retail Price (MSRP) of 74.95€ incl. VAT. CPU cooling unit EK-SF3D Inflection Point EVO will be available by the end of the week.